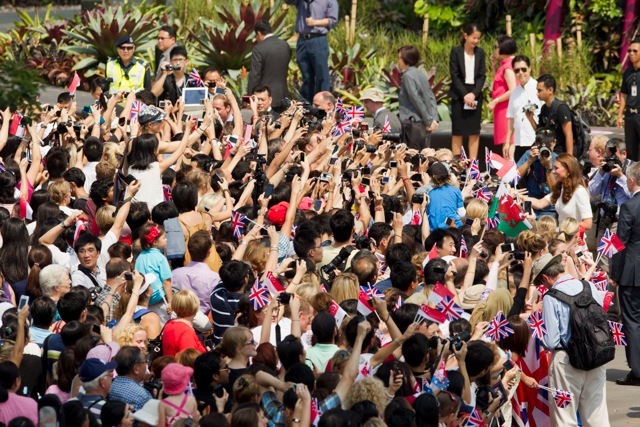 Day two of the royal tour began with a visit to one of Singapore's most beautiful parks Gardens By The Bay. William and Kate meet with a mother and baby. Large crowds of school children chanted 'Wills your brill, Kate your great' as the couple arrived. 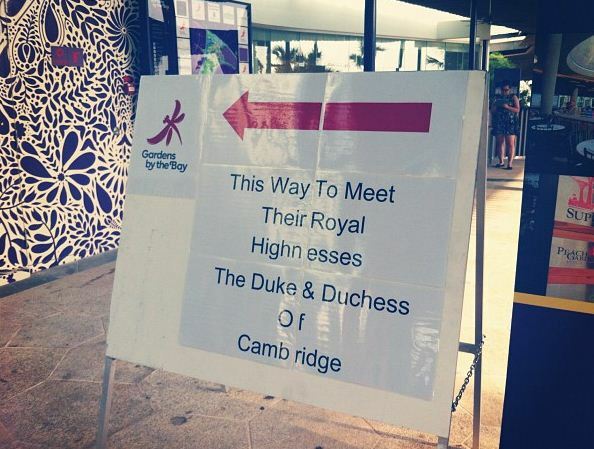 Today's visit to the Gardens by the Bay is the first opportunity the public have had to meet the couple. Very exciting for those who went along. Their Royal Highnesses got into golf buggies for their tour of the gardens and visited a large glass dome at the gardens in which is housed an artificial rainforest mountain. The royals were accompanied by a guide who explained the flora and fauna contained in the dome. 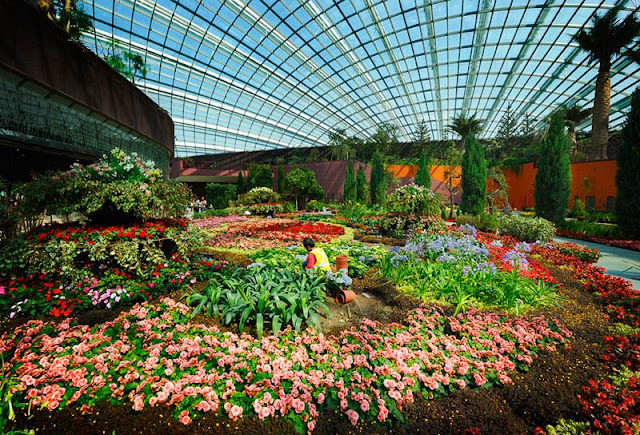 Gardens by the Bay is a park spanning 101 hectares of reclaimed land in central Singapore. The park consists of three waterfront gardens: Bay South Garden, Bay East Garden and Bay Central Garden. Gardens by the Bay is an integral part of a strategy by the Singapore Government to transform Singapore from a "garden in a city" to a "city in a garden". 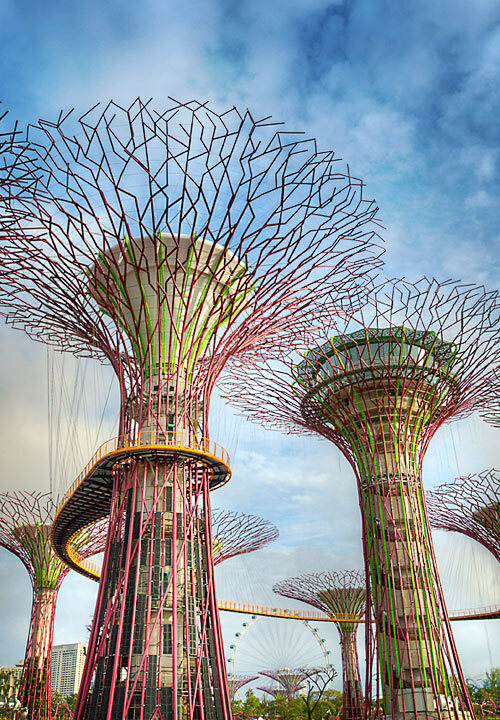 The Supertree Grove at Gardens by the Bay. Exchange students Lucie and Tessa were first to arrive at 5.30 a.m. this morning hoping to catch a glimpse of the Cambridges. The couple went on a walkabout and met with members of the crowd before they left. Many people were shouting 'I love you' as they walked past. A young child asked William what superpower he would like to have and the Prince replied 'to be invisible'. The Prince also revealed he would like two children. Kate chatting to a group of children. Kate bent down and picked up a flyer a girl had dropped. She said she was very touched. Kate wore a white broderie anglaise full skirted suit by Alexander McQueen. It is thought to be a bespoke piece. The vee neck three-quarter-length sleeve belted piece is a lovely choice. Quite summery and elegant. The Duchess has a wonderful relationship with Sarah Burton (designer of Kate's wedding dress) and the pieces she designs for Kate are always stunning. The Duchess wore her Stuart Weitzman Corkswoon Wedges. The blue wedges were a favourite of Kate's through the London 2012 games and I expect we'll see Kate wearing them again during the tour. The Duchess carried her Stuart Weitzman Muse clutch. Kate wore Diana's sapphire and diamond earrings. An interesting tweet from royal commentator Robert Jobson. And a poignant tweet from royal photographer Mark Stewart. 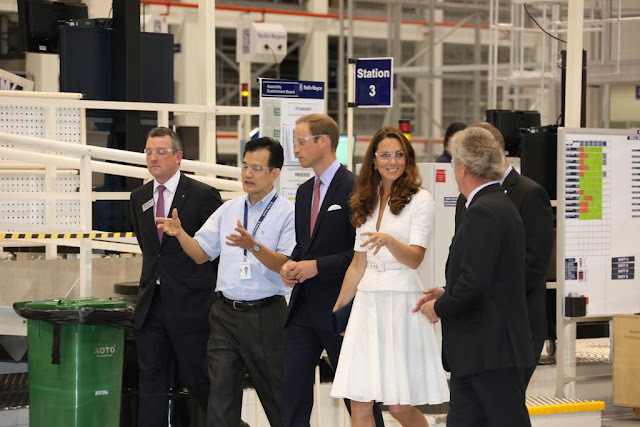 Following their visit to the gardens, William and Kate travelled to the Rolls Royce engine aircraft factory in Seletar, Singapore. When fully up and running, the factory will produce about 250 engines a year. The Rolls Royce group is a British success story with a customer base comprising more than five hundred airlines and one hundred and sixty armed forces, as well as marine and energy customers all over the world. 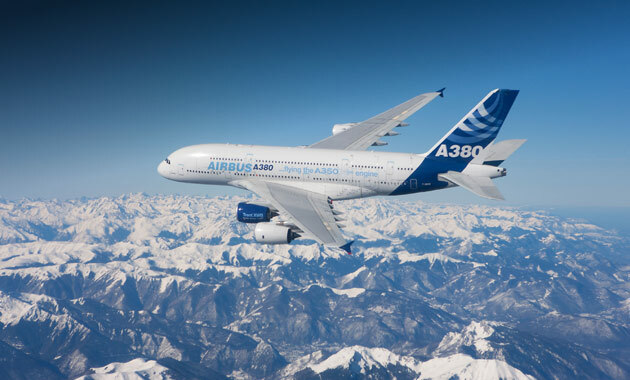 The factory will produce engines for large aircrafts such as the A380. The couple enjoyed a tour of the factory where they met staff and saw engines being assembled and tested. William and Kate with little princess Maeve Low. 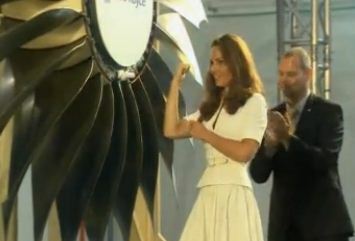 Prince William made a speech praising Rolls Royce and Kate jokingly flexed her muscles after pushing a fan blade into place on an aircraft engine. A very special photo of Kate hugging a little girl to finish up the post. At 2.45 p.m. SGT William and Kate will visit Strathmore Green, a precinct in Queenstown. The couple will view cultural performances and meet local residents. Working at warp speed again!! Love it, thanks. Thank you Charlotte for this great up date. You must be really tired. Loved her dress again. And the comment made by the royal reporter is an interesting one. Then the one made by the photographer sent chills down my back. You have to stop and think was William's beloved mother there with them when they saw her flower. You have to wonder. Can't wait to see if the beautiful Duchess will change her clothes before dinner tonight. I do think we'll see an outfit change for tonight. Looking forward to seeing a close up photo of the McQueen suit! Amazingly quick recap! You deserve some kind of award... Keep up the great work! Ahhhh, not the wedges AGAIN!!! Can't wait to see better details of the dress emerge - it looks beautiful from the side view. Thanks for the quick update, Charlotte - and looking forward to more appearances! NOOOOOOOOOOOOOOOOOOOOO SHE BROUGHT THE WEDGES!!!!!!!!! Wow! Quick posting, I'm just reading the tweets from the reporters along with Will and Kate! Great job with this blog! Not such a fan of this dress. Her outfits are just striking out with me, they seem overly fussy for some reason. I know it's a state occasion but they just seem overdone. The dress is VERY dressy and the wedges say less formal, an odd mix. Are you sure you have enouigh coffee to last for the entire tour??? Charlotte you are doing a lovely job keeping us informed. Thank you!! The comment from the Royal Photographer brought tears to my eyes. Oh yes thank you! The event started about 3 a.m. my time (in the UK) so I was lucky enough to get a few hours sleep, We only have one tour each year and I wanted to cover it as well as possible. The tweet about Diana was terribly sad I must say. Such a pity she was taken so young. The dress is soooo feminine! Loved it! She looks stunning wearing white outfits! But I'm not sure if those wedges are matching the dress! Thank you for being so fast! I think the wedges are just fine. She's wearing white/cream so they certainly don't clash and I think they help set off her sapphire ring and earrings beautifully. Simple but lovely. Hi, Sara! 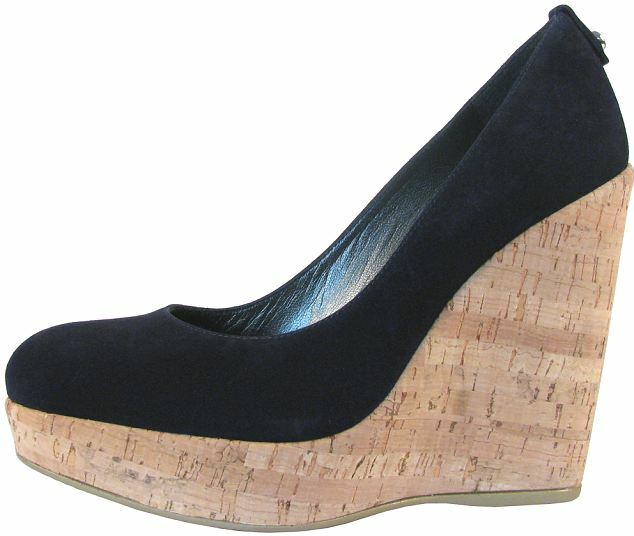 I have a pair of wedges and I agree with you, they are very comfortable! But I think the dress seems too light and flowing and the wedges too heavy! Also I think the cut flatters her SO well, as McQueen/Burton always does...the sleeves, the deep V that don't show anything but still gives that hint of youthfulness and then the tiny waistline with the flare skirt. Kate and McQueen hit it out of the park every time! It's a beautiful piece! Kate and Sarah Burton work so well together. Loved her dress but the wedges dint quite match, maybe she wore them to take a break form wearing heels? ?she still looks pretty nevertheless :)) Thanks CHARLOTTE!!!! I loved the simplicity of this dress. I have noticed that Kate has gained a little weight and it did very well for her, because the dresses she has worn on this tour are combining more than the dresses she wore in the USA-Canada tour. 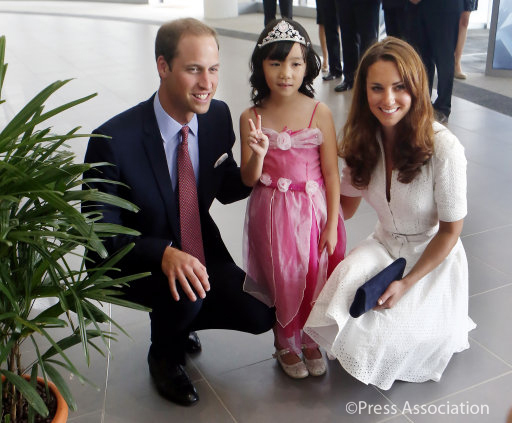 By the way, congratulations, Charlotte, for the excellent coverage on W & K on the Asian tour. Charlotte, you are amazing! No one else is this fast and thorough! 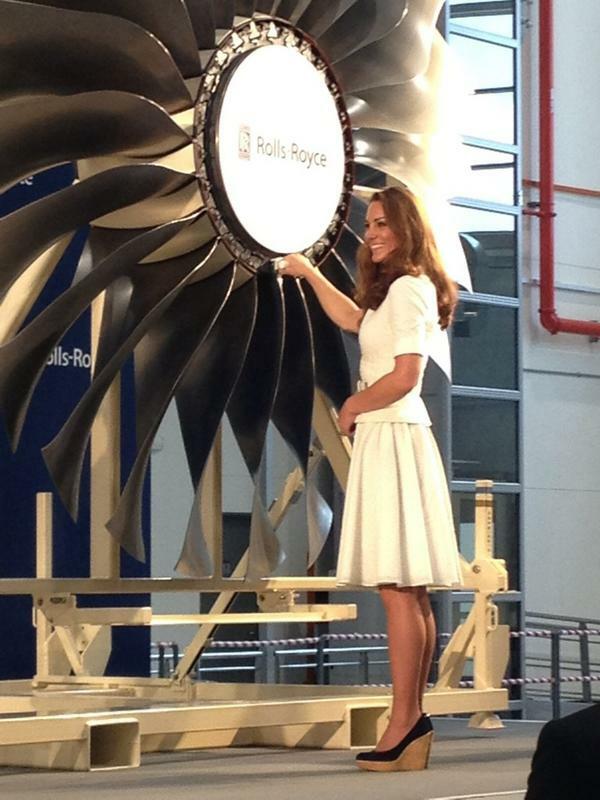 I think this dress is really pretty, not to hot on the wedges but otherwise the Duchess looks lovely! Can't wait to see the ensemble tonight! I love, love, love the dress! It's so weird, I saw the McQueen exhibit at the Met last summer, and so whenever I see a "Kate wears McQueen" headline I almost expect to see a crazy Lady Gaga-esque outfit. Instead, Sarah Burton crafts such exquisite and ladylike pieces that show a whole different side of the amazing McQueen brand. On the negative note - I hate, hate, hate those wedges. I don't mind ALL wedges (in fact, I think the ones she wore around the time of her wedding were lovely) but these ones are just so chunky and heavy-looking. I wonder why she wants to wear shoes with so much height even though she's quite tall already? I just think the eyelet lace would have gone so well with some delicate, flatter sandals or open-toed heels. The dress is lovely! Feminine, light, beautiful. Only the wedges don't work at all. Way too chunky for this dress. 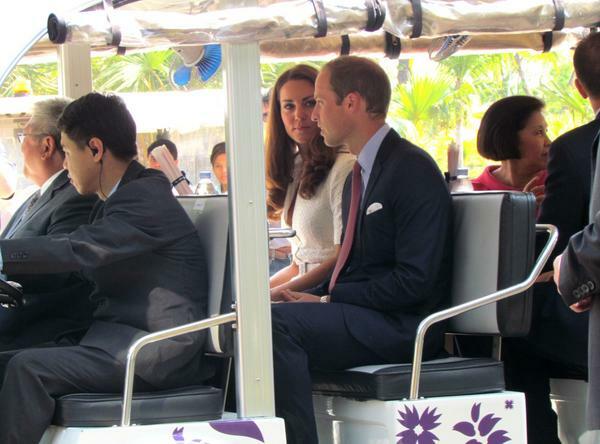 Especially in the pic where Kate is seen from the back, bending. I hope we don't see them too much this tour. Thanks Charlotte! Super post. Much better than the non-existant UK TV coverage! Thank you Charlotte for my nice start to the day! :) The outfit- I´ve never was a huge fan of Kate´s navy/white ensembles as I like her more in warmer colours, but this one is superb!!!! Slightly vintage, something like the Queen would wear when she was Kate´s age, visiting her "Imperial family" but still young and fresh enough.I really take it as a nod to the Queen. Very nice example of collaboration between the Duchess and Sarah Burton. What more- this is the first time I´m not irritated by those high robust wedges, they really balance the proportion - length and volumen - of the skirt here and point out her saphire jewells. As always, this blog offers the best coverage. I agree with everybody disapproving of the wedges. they worked well with her Olympic attire, but I wish she had worn lighter sandals with this suit, it really does not work well imo. Her hair isn't as sleek as usual, but at 36°C, she really gets credit for looking so good!! I think Kate was beautiful. I love the white dress and I agree with Jemma, she should had worn her hair up, because of the hot temperatues. Love the outfit but if she wanted blue shoes her navy pumps would have looked better. The " wedges of doom":-) don't quite work here. Charlotte thanks for the great posts!! Beautiful English embroidery dress for the lovely Kate! How cute this photo of William and Kate with little princess Maeve Low. I think they would be wonderful parents. I don't see a problem with the shoes. Navy and white is a classy combination and it's a nice contrast. Besides, the eyelet design of the fabric leans towards casual so the look is just fine. Had she worn a lighter color, she'd be accused of looking like a nurse. LOL. Thank you! Your posts are always fantastic! I really appreciate the combination of pictures and info on Kate's outfits, pictures and info on the sights they're visiting, and little details like their conversations with onlookers and tweets from the press. I really like this outfit. I'm also 7 years younger than Kate and tend to like everything she wears- even the things critics don't like so much. I love Kate's style and have bought several things inspired by her wardrobe. Re the wedges- they may have been necessary today. Sometimes a solid-bottomed shoe is necessary to safely walk on surfaces like AstroTurf and grates. Kate may have encountered a drainage grate or two at the Rolls Rouce factory- or been told or assumed that she might encounter one even if she ultimately didn't. I have to wear wedges or flats on my commute to work because my city has lots of grates right in the middle of the sidewalks. Heels get stuck in them which ruins the heel and can easily cause an injury. I love that USA Today refers to your blog -- 'The always reliable HRHDuchessKate blog' -- when describing Kate's outfit in their article this morning. 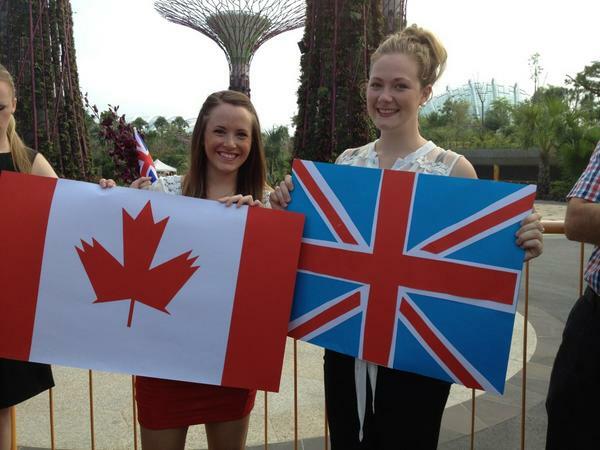 I was at Gardens by the Bay this morning with my daughter, who is also a Kate! We waited for 2.5hrs in Singapores scorching heat and thankfully got to see her and William. My daughter, however, was a little squashed by the crowds but did still manage to have her "I'm a Kate too!" sign up. Kate read it and laughed :). Everyone walked away agreeing that the time spent in the heat was absolutely worth it. It was a wonderful opportunity for me and my daughter to see a real life 'princess'. Kate was absolutely gorgeous, and William very handsome. Diana would be so proud of them. I'm delighted you had the opportunity to see Kate, No doubt a very special and memorable experience for your daughter. 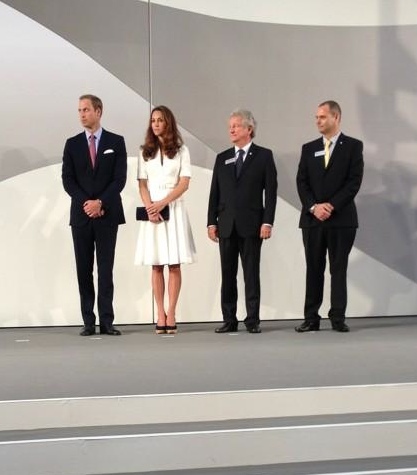 also, what a surprise to find my friend (living in Singapore) in the 2nd pic of this post (the lady in white dress with black flower motives), talking to Prince William! i shared it with her and she was sooooo happy! The dress was really nice, but these shoes are not appropriate...Kate is a really elegant person, but sometimes she makes strange choice.